Sales and marketing directors often manage salesforce effectiveness, customer service and marketing activities all at the same time. With such a diverse range of responsibilities, access to a consistent and accurate customer database is paramount. Unfortunately, in their demanding role most sales and marketing don’t have access to the right data, which directly impacts negatively commercial operations success. 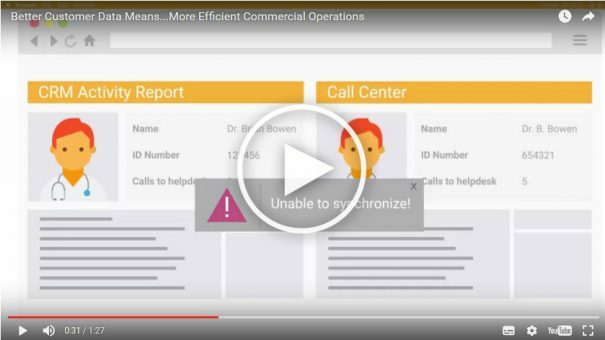 Due to duplicate or outdated customer profiles, simple marketing campaigns are much more expensive and ineffective than they should to be, reps could waste time visiting the wrong HCP, and helpdesk calls might not be correctly synchronized with the CRM. Given the dynamic of healthcare professionals and organizations landscape, it is necessary to process change requests quickly to ensure accuracy of data. The solution is a new approach to customer reference data that is rigorously verified, continuously and proactively updated and centralized across all business functions and countries. Responsive data stewardship with data change requests managed within one business day is the key for quality data. With accurate customer data, marketing campaigns are optimized. Promotional material is sent to the right customers with the right message at the right time. With data change requests initiated directly from the CRM system, and confirmation that the update has been resolved within the day, field forces increase their trust in the CRM system and see their productivity optimized. Helpdesk team can also report their calls and activities in a more efficient way by finding right away the correct record. Given the ever-expanding role of data in today’s industry, accurate, high quality data is a must to support nimble commercial operations to keep pace with a dynamic market.